If you've been in the classroom for even a year or two, you probably have seen first hand how word knowledge helps students better understand the content they've read. Without a schema for a topic, there is no place to attach new information, right? Plus, a growing vocabulary transforms kid writing into sophisticated pieces and improves speaking skills too. 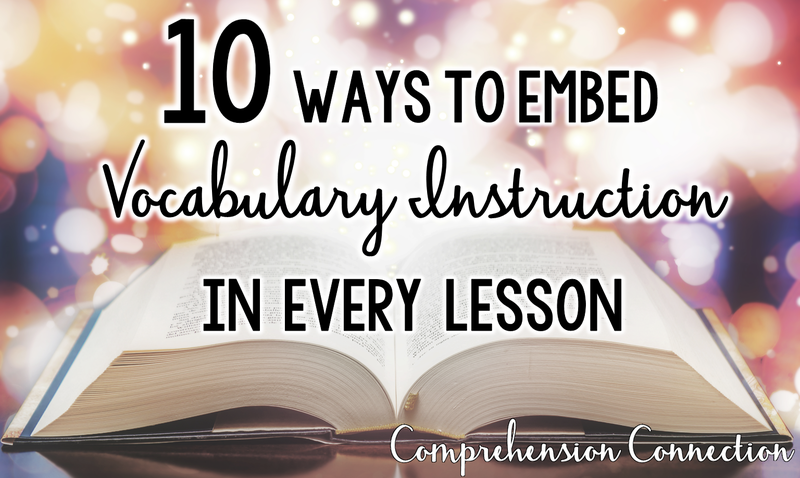 So how can we as teachers embed vocabulary into every single lesson? Today, I'd like to share ten suggestions to get you started. Of all teaching strategies, think aloud has been shown to be the most effective for skill instruction whether we're focusing on comprehension or vocabulary. As you share read alouds, it's important to keep them interactive. Stop and discuss rich words. Demonstrate how to use context clues, synonym/antonym connections, picture clues, and knowledge of prefixes, suffixes, and roots through your discussion. Most importantly, plan ahead for these conversations by preselecting important words in your lessons that you know you will talk about. One way we can remember important information is with pneumonic devices such as ROY G BIV, rhymes, or jingles. With new words, you might have students work in teams to create rhymes or jingles that highlight the meanings of the selected words. This type of activity connects with kids' love of pop music and rapping. On the same line as jingles, you might have your kids act out words in mimes. I always loved the game Cranium, and my kids did too. Acting out key words for the remaining students to figure out builds background. Once a word is identified, follow up discussions can help scaffold understanding for some and solidify it for others. It takes 10-15 exposures to a word for the word to be mastered, so having a variety of options helps build mastery. As new words are discovered or introduced, it's important to spotlight them in visible locations. One way I've spotlight testing vocabulary is by posting skill based language. As new skills are taught, they're clipped. I also believe it's important to have a WOW Words Word Wall. Having kids share new words they discover encourage an importance of broadening vocabulary. The thing we want as teachers more than anything else is to see growth and application. We want kids USING the new words they learn in their speech and in their writing. 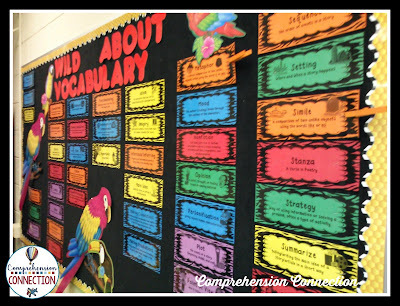 Word walls and personal dictionaries really help encourage kids to use new words. 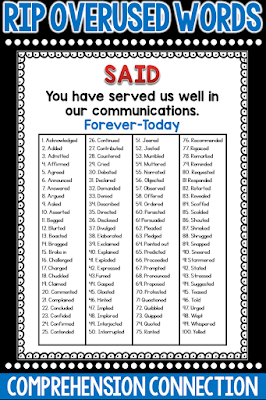 You may find that your students use the same words all the time. You know the conversation. Mom: "How was your day?" Child: "It was good." "How do you like your teacher?" "She's nice." 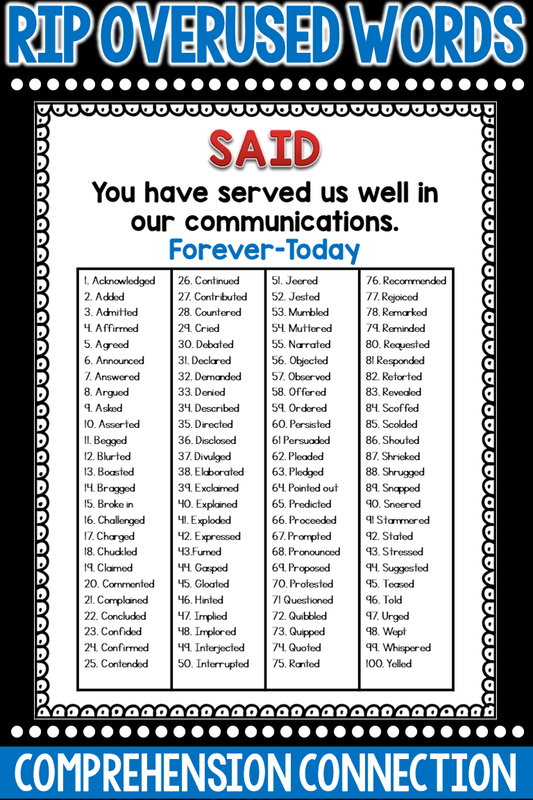 You might share with your students a list of overused words. Put them up on your wall, and as a group, work to create alternative options. Some that pop in my mind are said good, nice, big, small, sad, happy, and bad. There are many other too. Using apps like Wordle to identify overused words in student writing helps them end redundancy, learn to use a thesaurus, and most importantly, exposes our kiddos to new, rich vocabulary. Of all vocabulary building activities, I find these activities to the best for improving writing, but also one of the best for exposing kids to richer words. Reciprocal teaching refers to an instructional activity in which students become the teacher in small group reading sessions. 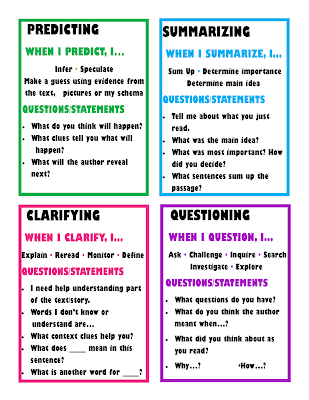 Teachers model, then help students learn to guide group discussions using four strategies: summarizing, question generating, clarifying, and predicting. 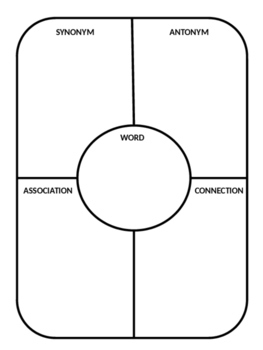 As part of these roles, the clarifier is tasked with the job of locating interesting vocabulary and explaining to the group what the words mean to clarify the author's message. Reciprocal teaching has been proven to be a very effective way to help students drive their own learning, and it's a great way to build community too. 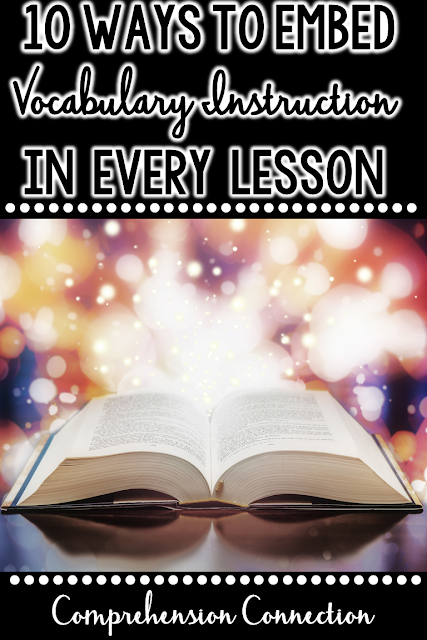 To learn more about reciprocal teaching, check out [THIS POST] on Reading Rockets. There are so many word building games available in your local toy store, and there is no reason why these games can't be used in the classroom too. We can work vocabulary into our word study routines with games, into our transitions with games, and even into our literacy workstations. Games are motivating, and for a great collection of vocabulary game ideas, check out [THIS POST] by my friend, Mrs. O Knows on our collaborative blog, Classroom Tested Resources. She included a wonderful freebie explaining 10 different game options you can try. 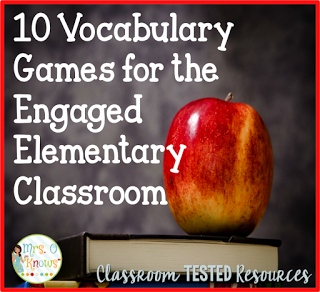 They're a win-win...grow vocabulary and up the engagement in your room. For our ELL students, making vocabulary visual is really helpful. Using drawings and photographs with labels helps remove the need for English to understand what a word means. When children are new to our country, it's important to help the ELL child connect knowledge of the world (native language) to the new language. Check out this use of Padlet from Engaging and Effective on TPT. I love Padlet, and it's a great tool for vocabulary discussion. To watch the video, simply click the image to the left. It is linked to Enaging and Effective's free video. Using graphic organizers to practice comprehension skills has been widely recommended as a teaching strategy for comprehension, but organizers also help students make connections between what is known and what's being learned. Semantic mapping helps students identify common roots, with categorizing words, and even with usage. Teachers can use Venn diagrams, tree diagrams, cluster diagrams, and webs to make these connections with students. The organizer to the right is a freebie from Hometown SLP. I've used something similar in a jigsaw where each small group is tasked to present their word to the rest of the group using their map. It provides a great segue to deeper discussion. Last but not least, don't forget to teach your kids to break down words into parts and chunks. Kids need to "see" common prefixes, roots, and suffixes, word parts in compound words, and derivations of words. As mentioned previously, word study provides an opportunity for word exploration at the Syllable Juncture and Derivational Relations stages. Teachers can also include studies of "word parts and chunks" in literacy workstation activities. A student's vocabulary is one key indicator of success in school and especially with reading. Students in print rich homes who hear rich vocabulary and have broad experiences are certainly at an advantage, but there is A LOT that we can do to change a student's trajectory in life. By planning for vocabulary instruction and making it a focus for our classrooms, we can help all of our students grow their vocabulary dendrites. I hope that these teaching ideas will help you think of ways you can help your students see how fun learning new words can be. For more information on vocabulary instruction, I do have a few educational resources I'd recommend you look for. I have read Bringing Words to Life and Creating Robust Vocabulary by Isabel Beck and Margaret McKeown and Word Nerds by Brenda Overturf and Leslie Montgomery. You can also view other vocabulary posts on my blog by clicking the vocabulary tab to the right.